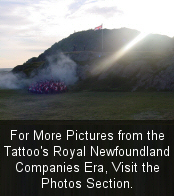 he Royal Newfoundland Companies formed the Imperial Garrison in St. John' s from 1824 to1862. The first detachment of the Royal Veteran Companies disembarked in Newfoundland on 19 Nov 1824. Two years later two of the garrison officers, Captain Mark Rudkin and Ensign J. Philpott fought a duel in the early hours of the morning. Rudkin killed Philpott with one shot to the chest marking the last duel fought in Newfoundland. Sir Thomas Cochrane, Governor of Newfoundland, wrote of the first contingent, " that the men for the most part are worn out and decayed soldiers, totally unfit to perform the duties necessarily imposed on them, or to encounter the severity of the climate, which can only be successfully met by strong able bodied young men; as is sufficiently proved by the number constantly in the Hospital, or who have been surveyed and found unfit for duty; the consequence of which is that this small detachment has at no time been within thirty or forty of its proper strength." Lieutenant-Colonel Sir Richard Henry Bonneycastle, Commanding Royal Engineer, writing in 1842, had a different perspective, describing the Regiment as " a fine healthy looking Regiment of comparatively young men....which regiment might take its place in line with some of the best troops of Britain." 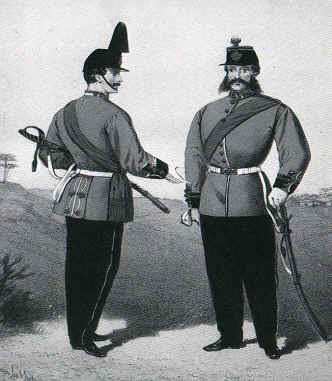 Throughout the period 1824-1862 the Regiment strength seldom exceeded 400. The main duties often tended more to the civilian side than the military. In addition to common guard duties, the Regiment also played a significant role in fire fighting, port signaling service and assisted the civil power in the absence of a local police force. Guards were mounted at Fort William, Fort Townshend and Signal Hill. During the winter months it was not uncommon to find sentries frozen to death from the extreme weather. 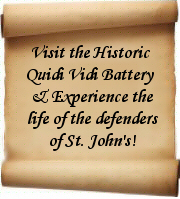 Even more tedious was the constant work parties which were formed to complete the various military fortifications around the town of St.John's. The Regiment was also called upon for ceremonial occasions for important visitors to the town. Until 1836 all soldiers attended Sunday service at St. Thomas's Anglican Church. After 1836 the Catholic members of the Regiment were permitted to attend their own Roman Catholic Church which was later to become the Cathedral of St. John the Baptist. In the mid to late 1800's Newfoundland was often the scene of religious violence between Protestants and Catholics. After Responsible Government was granted to the Colony in 1832, Catholics tended to align themselves with the Liberal Party while Protestants with the Conservatives. Mr. Henry Winton, was the editor of the local newspaper The Ledger. He was a protestant and a fierce critic of the Catholic Bishop, Michael Fleming. On Christmas Day in 1832 a catholic crowd surrounded Mr. Winton's house and the Royal Newfoundland Companies were called out to disperse the mob. The next day the Liberal Catholic Party wrote " that as several unoffending citizens have been deeply injured, some deprived of their liberty, and others bayoneted by the soldiery, that we offer them the need of our cordial sympathy, and at once desire the means best calculated to ensure them ample redress by law." The Royal Newfoundland Veterans were initially housed at either Fort William or Fort Townshend. For a short period the soldiers were moved atop Signal Hill where a new barracks was constructed to reduce the overcrowding in the two town forts. From the beginning it was clear that the new barracks was entirely unsuitable. The high winds atop the summit created a cold and damp that easily penetrated the stone walls. In 1842 when the infant child of one of the soldiers died from the cold the Commanding Officer ordered the removal of all troops to Fort William or Fort Townshend. The Royal Newfoundland Companies were eventually disbanded after a riot in 1861 when the Companies were called out to disperse a mob incensed by an election dispute. The soldiers fired into the mob killing several and wounding several more. 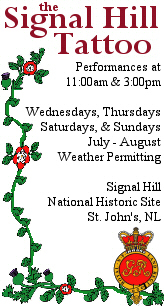 From 1862-1970 the Royal Canadian Rifles were stationed in St.John's until their eventual departure. While there are many references to the Royal Newfoundland Companies at the Provincial Government Archives in St.John's Newfoundland, it is our understanding that the personal records of the Royal Newfoundland Companies are held in the Rolls Room, Public Records Office, Chancery Lane, London, W.C. 2, England.